Why did water levels in these wells some 3,800 miles away from the earthquake’s epicenter change? Tuesday’s earthquake epicenter and the location of the two wells in Florida where water movement was detected. Vibrations that move through the earth called seismic waves are the culprit. Seismic waves are depicted by the upward and downward lines on seismographs used to detect earthquakes around the world. “Water levels in wells respond to the seismic-wave induced expansion and contraction of the aquifer tapped by the well, in turn causing step or oscillatory fluid-pressure changes,” the USGS says. The changes in groundwater levels are often seen hundreds, or even thousands, of miles away from an earthquake’s epicenter. Note from Pastor Kevin Lea: It is an established fact that major earthquakes can affect wells, lakes, geysers, etc. that are thousands of miles away. The 7.9 Magnitude Denali, Alaska earthquake, on November 3, 2002 exhibited similarly shocking events which convinced even the hardened critics that these strange phenomenon were linked. Then and now, headlines say that people are “shocked” by these events because the power of seismic waves diminish by the cube of the distance; meaning they should be incapable of shaking entire lakes or change well water levels that are thousands of miles away, no matter how shallow or deep they are. In addition, none of the seismologists attempt to explain why all the hundreds of lakes between Denali, Alaska and Lakes Union/Pontchartrain failed to experience their own shaking. How could this be since the power of the seismic waves is greater the closer they are to the epicenter? But the evidence is conclusive, these events are connected and seismologists simply attribute this phenomenon to the seismic waves despite the laws of physics seeming to contradict this rationalization. Dr. Brown’s theory starts with one assumption: that the earth was created with a large body of water under the crust. After the water heated due to tidal pumping, the crust ruptured and the trapped water under extreme pressure burst up and became the fountains that created global rainfall for 40 days and nights and also caused the water to prevail on the earth until the 150th day of Noah’s flood (Genesis 7:11-24). Then the mid-oceanic ridge formed when the mantle bowed up into the now widened crustal crack. 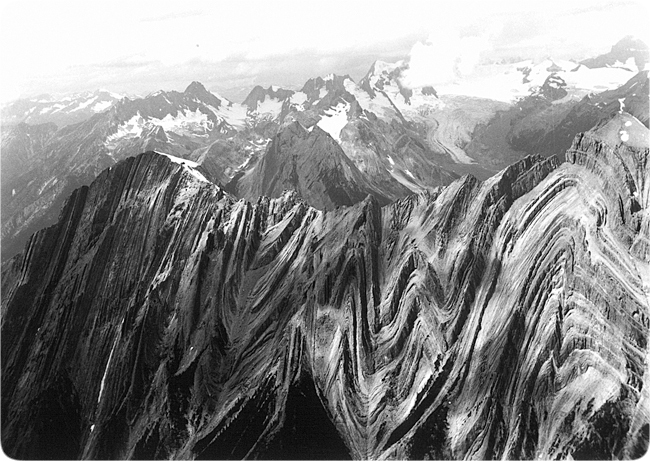 This elevation of the mantle resulted in the crustal plates moving away from the raising ridge, toward the pacific, where they crashed to a halt, causing the mountains to form in a matter of hours as this picture from the Canadian Rockies makes perfectly clear. This catastrophe on the earth, about five thousand years ago, left magma and subterranean water in the area between the crust and mantle to this day. This remaining liquid acts as a hydraulic conduit, where energy pulses from major earthquakes can be transmitted for thousands of miles in the same way that pushing on the brake peddle of your car can transfer your foot’s energy to the slave cylinders/calipers of your wheel’s brakes. In summary, seismic waves traveling through the crust cannot shake an entire lake thousands of miles away, but the pounding crust can push on the trapped water and magma sending hydraulic pressure under the entire continent, which then manifests itself in areas of crustal weakness (Lakes Union and Pontchartrain, etc.). Tragically, many people who search for answers about creation and Noah’s flood have not heard of Dr. Brown or his theory, even though they may subscribe to Answers in Genesis (AiG), Creation Research Society (CRS), Creation Ministries International (CMI), or Institute for Creation Research (ICR). How could this be when a Google search on the: origin of the Grand Canyon, origin of asteroids, origin of comets, origin of earth’s radioactivity, etc., which are all related to Dr. Brown’s hydroplate theory, are either the first hit or on the first page of hits pointing to Dr. Brown’s online book? It is my opinion that the main reason is that most of these organizations have embraced an unbiblical theory for the flood of Noah called Catastrophic Plate Tectonics (CPT). Many have pointed out to these supposedly biblically based organizations that CPT is both unscientific and is not consistent with the biblical account of the flood (which means it cannot be true). But they continue to prop it up in their museums, DVDs and books anyway, thus deceiving all those who are drawn into their product selling net. Dr. Walt Brown’s theory is consistent with the Bible in every detail, and makes so much more sense to people than CPT, which is why it scores so well on Google searches. Since the hydroplate theory is available free at creationscience.com as an online book, it competes with their CPT and related products that they sell. Maybe this is why they feel like they must continue to falsely malign Dr. Brown and his work. Many are convinced by these organizations to discount Dr. Brown’s work when they accuse Brown of not submitting his work to peer review. By peer review, they mean submit his book to them for their critique. This is like saying that no one should have listened to Galileo teach that the sun is the center of the solar system because he had not submitted his findings to the Pope for review. In October of 2017, Dr. Steve Austin, who was formerly the lead researcher for ICR, was asked by a person attending a lecture he was giving about the Grand Canyon, what he thought about Dr. Brown’s 42 page chapter on the same subject. Dr. Austin’s response, according to someone who was there and conveyed it to me, was that his (Austin’s) book was peer reviewed but Dr. Brown’s was not. I find this incredible considering Dr. Steve Austin has known for decades that he plagiarized some aspects of Dr. Brown’s hydroplate theory discoveries that unlocked the enigmas of the Grand Canyon’s origin, which Brown published in 1989. Austin then put the items he choose to plagiarize into his 1990-1992 Grand Canyon Guide books, then later in his book (after some deceptive changes in order to try and cover-up his theft). But since Dr. Steve Austin is an adherent to the unbiblical and unscientific CPT theory for the flood, the information that he stole from Brown does not and cannot allow the reader of his book to come away with a scientifically sound understanding of how the Canyon was formed. Dr. Brown’s theory and book, based on his own discoveries, does provide an easy to understand explanation, from cause to effect.